Balance the mango on one of its narrow sides, then slice off one of the wide sides of the fruit. Try to cut as close to the seed as possible, usually about ¾ inch from the center. Repeat with the other wide side, then slice off the remaining narrow pieces of fruit. To dice a mango, cup one of the unpeeled pieces in your palm and use a paring knife to score the fruit into the size of dice you want. Be careful not to cut through the skin of the fruit (or into your hand). 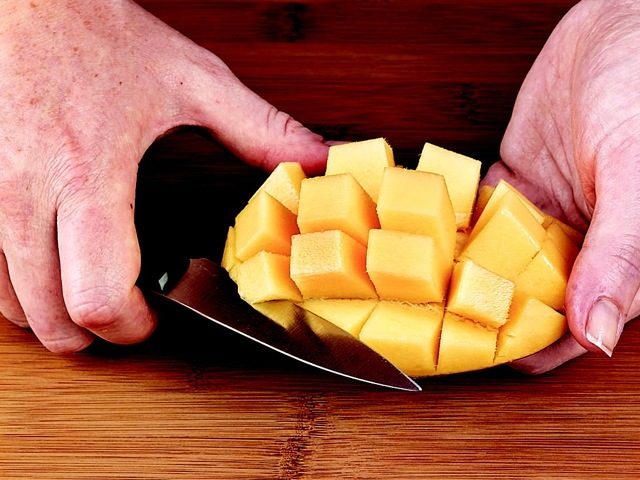 Use your fingertips to pop the mango inside out, then use the paring knife to slice the dice away from the skin.